Although known as Chinese pearl barley, this popular Chinese food has no connection to barley. They are not even from the same genus. The scientific name is coix lachryma-jobi L. var. ma-yuen 薏苡仁 (Yiyi ren) or 薏仁 (Yi ren) or 薏米 (Yi mi). Coix lachryma-jobi L. has a folk name: Job's tears and coix seeds and there are 2 varieties. One variety is commonly used as beads in jewelry making. The other variety is ma-yuen, the subject of this page. From what I know, it doesn't have a common English name, and because it bears a slight resemblance to pearled barley 小麦仁 (xiao mai ren) and is most commonly grown in China, it has been called the Chinese pearl barley. The Chinese believes that the coix seeds are diuretic, anti-swelling, pus-expelling and cooling. It is therefore most commonly recommended to people suffering from stiff and painful joints, rheumatism, warts and eczema. Findings from recent scientific research conducted by Japanese scientists have been positive. As mentioned, coix seeds has been frequently mistaken as pearled barley. In Singapore, many food packages mis-translated them too. It means that if you wanted to buy coix seeds, you might end up with pearled barley instead. It is important to be able to differentiate the two if you intend to consume job's tears for its curative and medicinal properties. To clear the air, here are 2 pictures of the 2 grains. 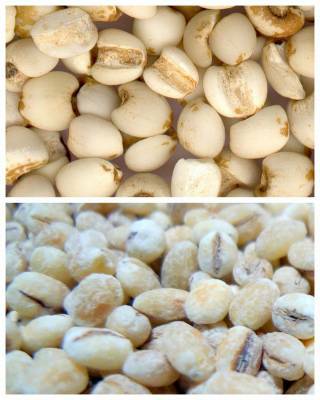 The photo on top is coix seeds and the one below is pearled barley. See the difference? Coix seeds are usually prepared in soups or congee as it is a grain and requires boiling. If you would like to try making something with this grain, you can buy the Hato Mugi - Jobs Tears - Gluten-Free Heirloom Quality Kosher Certified -17.6OZ from Home Naturals, Inc at Amazon. It is all natural, with no chemicals added. Every grain is hand selected. This barley recipe contains coix seeds, lotus seeds and red dates and is a sweet Chinese soupy dessert. It is a very light dessert, a gentle way to end a meal. People with stiff and painful joints, rheumatism, warts and eczema may find it helpful. Frequently served to the elderly as a nourishing dessert.